Seven downy wood duck ducklings follow their mother closely on Mill Pond on an early June day. They can swim, walk, and feed themselves when they hatch, but they stay with their mother for about two months until they can fly. From their mother, they learn where to find food and how to avoid predators. Make way for ducklings! June is the month to begin watching for them on Westborough's waters. The beloved children's classic, Make Way for Ducklings by Robert McCloskey, tells the story of a mallard family contending with human civilization in downtown Boston. Here in Westborough we're fortunate that our natural environment is still untamed enough to offer a home to other wild ducks as well. Besides the mallards (Anas platyrhynchos) that swim with their ducklings near bathers at Lake Chauncy Beach in the summer, we may glimpse wood ducks (Aix sponsa) and their ducklings on our ponds. If you've noticed nest boxes on poles in Mill Pond and the small ponds at the Mass Fish and Wildlife management area, you've seen that wood ducks in Massachusetts get a little help from their human friends. Why do wood ducks need nest boxes? We don't usually think of ducks as nesting in trees, but wood ducks – as well as some other kinds of wild ducks – nest in holes in trees near water. They're safer hidden in tree holes than in nests on the ground at the water's edge, where mallards usually nest. Wood ducks often use tree holes originally made by woodpeckers, but they've also taken to properly designed nest boxes. Nest boxes are part of the conservation effort that saved our native wood ducks and made them one of the earliest conservation success stories. By 1900, uncontrolled hunting and the disappearance of forested wetlands had almost wiped them out. The federal government stopped the hunting from 1918 to 1941. Starting in the 1950s, nest boxes were set up to help them to increase their numbers. A pair of wood ducks in the spring. The male sports colorful breeding plumage, but the female remains well camouflaged in gray. 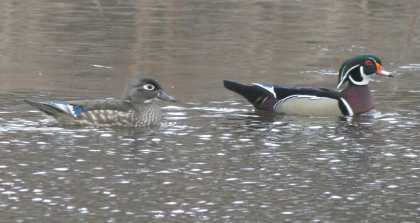 Today wood ducks are common on North American waters once again. Many states, including Massachusetts, now permit controlled hunting. In late winter and early spring - after the fall hunting season - you can sometimes spot pairs or small groups of wood ducks on our ponds. Both males and females have crests on their heads. The males are decked out in dramatic breeding plumage. Once the females start incubating their eggs, the colorful males leave. It's probably safer for the eggs and females that way. All the eggs in a duck's nest usually hatch at the same time, even though they were laid over a period of two weeks. How do they manage to be so well coordinated? The mother duck has something to do with it. She only starts warming the eggs in earnest once most of them have been laid, so they all tend to develop together. Surprisingly, the ducklings inside the eggs also play a role in hatching together. As the time approaches, they make clicking sounds to communicate with one another through the shells. The older ones click slowly, and the younger ones click rapidly. This communication helps them adjust to one another. Finally, when the first duckling breaks out, the other eggs get jostled, which encourages the ducklings inside to work harder to get out. Newly hatched ducklings leave the nest promptly. Wood duck ducklings depart within a day of hatching. When the mother calls from outside, they jump one by one out of the nest hole onto the water or the ground, dropping a few feet or 20 or 30 feet or more. It's a rare but rewarding sight, if you're lucky enough to see it. The new ducklings are downy and very capable. They swim, walk, feed themselves, and stick together as a group. Wood duck ducklings can make three different calls - to sound an alarm, to make contact with their mother or other ducklings, and to pose a threat. They eventually learn 12 calls. Sticking with mom is a survival skill. 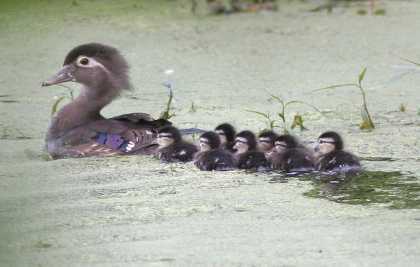 The mother leads the ducklings to food – insects and water plants – and safety among pond grasses and vegetation. If a predator approaches, she makes alarm calls that prompt the ducklings to scatter and hide in vegetation. She swims away from them, sometimes acting as if she is injured, to lead the predator away. In spite of these efforts, up to 90 percent of ducklings perish in their first few weeks. They become food for many other animals, including great horned owls, raccoons, snakes, snapping turtles, and even large fish and bullfrogs. The ducklings that survive generally stay with the mother until they're ready to fly, usually when they're about two months old. So turn your eyes toward the water when you walk trails along the shores of our ponds. Watch the marshy areas near shore. You might see a family of ducklings, or some young geese or swans.